A California winery is responding to Supreme Court Justice Ruth Bader Ginsburg’s claim that she was “not quite sober” after drinking a bottle of its wine before President Obama’s State of the Union address this year. 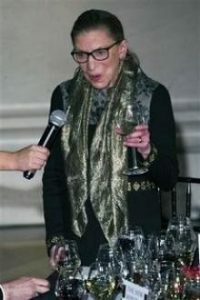 Christopher Barefoot, vice president of public relations at Opus One Winery in Oakville, Calif., said the winery’s staff was overjoyed to hear Ginsburg enjoyed their wine. “We were delighted to learn we were included in such an important meal. It’s a great feeling,” he said.